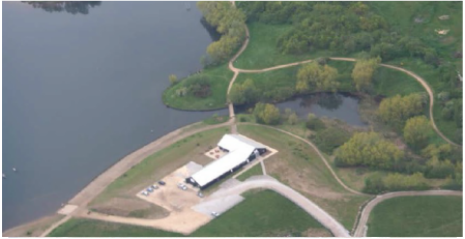 The growth in the activities taking place at the lake by Manvers Waterfront Boat Club and other partner organisations has led to a shortage of storage space for boats and other equipment. To remedy this situation Manvers Lake & Dearne Valley Trust have been planning for several years to build a new equipment store and are now in a position to proceed with the project having secured funding from Sport England, Veolia Environmental Trust The Key Fund and the Coalfields Regeneration Trust. The new building will accommodate up to 500 kayaks,canoes and sailboards plus other vital equipment such safety boats, marker buoys and trailers in a ground floor store room. There is also the potential to add a second floor at a later stage. Construction will start in April 2015 and is planned to be completed by September 2015. Everyone at the club is working hard to ensure that any disruption is kept to an absolute minimum so that the club can continue to function as normal during the construction phase.